So back in February the path from the back steps to the end of deck became a muddy mess thanks to the pups - their multiple trips out to use the potty (plus us going out there with them) led to this area being downright dangerous to walk on thanks to the gentle slope downwards and locks of slippery mud. 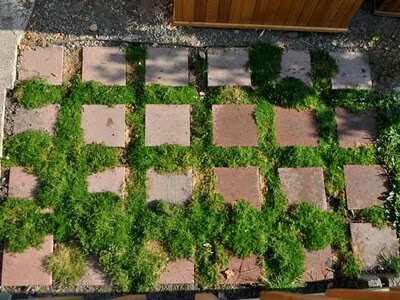 So instead of trying to regrow the grass the dogs killed we embarked on a project that involves pavers and Irish Moss. Don't let Rob fool you. He's not nearly detail oriented enough to really do this type of work. While Rob did help by doing the initial digging job and bringing me supplies, I was the one on my hands and knees with a ruler and level measuring out the distances in millimeters to keep things at an even distance and an even slope. Job well done, if I do say so myself. Last week (August) I took some pics of how it looks now. It filled in beautifully which is great because it gets a bit of filtered shade which had me worrying about the success of my little idea. 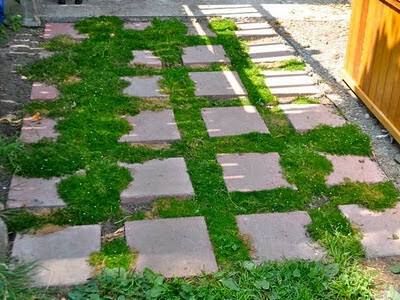 A couple of the individual plantings did die secondary to my dogs being incapable of going piddle in the grass. Late at night they take the minimum steps out required before they squat which generally leads them to peeing on the pavers. Sigh. 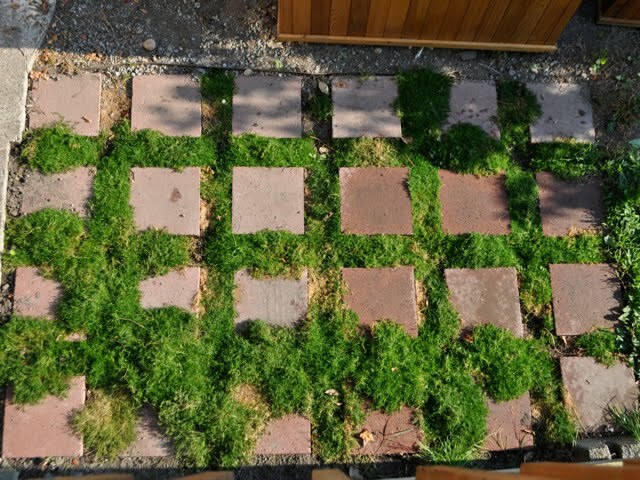 Even despite that the Irish Moss is really doing well! In fact if you look closely you can see some little white flecks throughout the green - those are the small white flowers they give off.